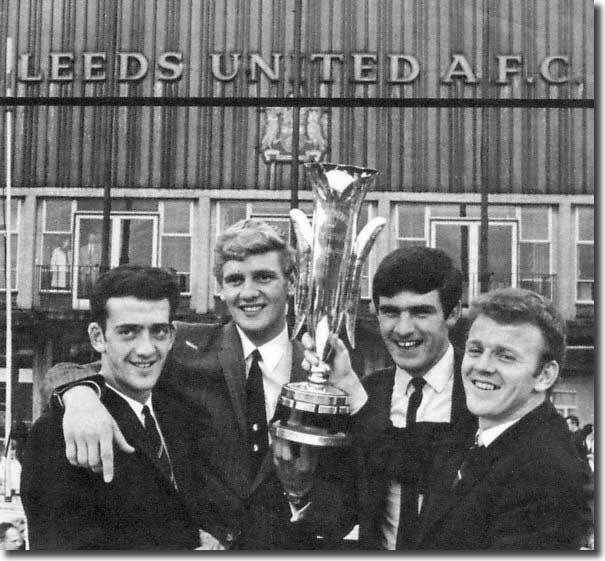 Terry Hibbitt's impressive entrance into senior football hinted that he could be one of the most glorious talents to emerge from Leeds United's golden generation of the Sixties. 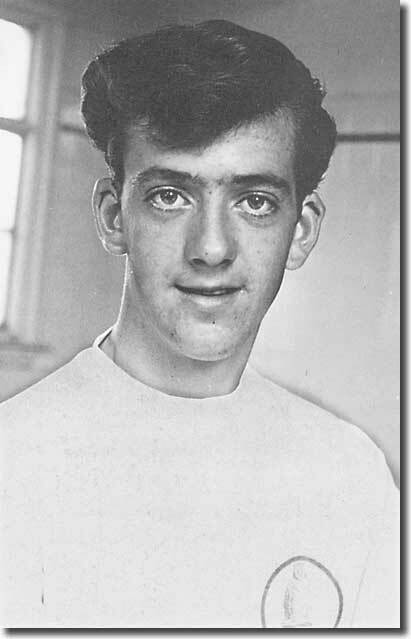 He was given his first team debut as an 18-year-old against Nottingham Forest on 19 February 1966, coming on as a first half substitute for Paul Madeley. Within minutes of taking the field Hibbitt scored a stunning goal, lobbing goalkeeper Peter Grummitt from 20 yards. For the next three years the talented left winger continued to show rich potential whenever given an opportunity by Don Revie, but he disappeared into the cul-de-sac of reserve team football after the talented Eddie Gray established himself as Revie's preferred choice on the left flank. A £30,000 transfer to Newcastle United in 1971 gave Hibbitt the chance of reviving his career, and he used the platform to give clear evidence of his prowess in a playmaking role. Hibbitt's younger brother Ken, born on 3 January 1951 and an England Under-23 cap, also enjoyed a long and successful professional career, mainly at Wolves (1968-84), with spells at Bradford Park Avenue, Seattle Sounders, Coventry City and Bristol Rovers. Frail of build and bandy of leg, Terry Hibbitt did not have a classic athlete's build, but he was an outstanding midfielder, playing cultured and intelligent football. He possessed a great range of passing skills and an instinctive feel for the through ball which benefited Malcolm Macdonald among others. 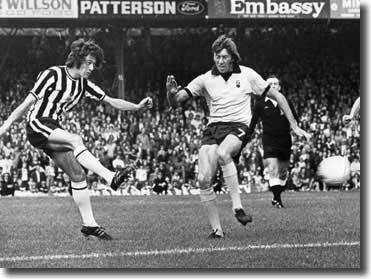 Toon midfield colleague Terry McDermott: "Hibby had a left foot that was like a magic wand. 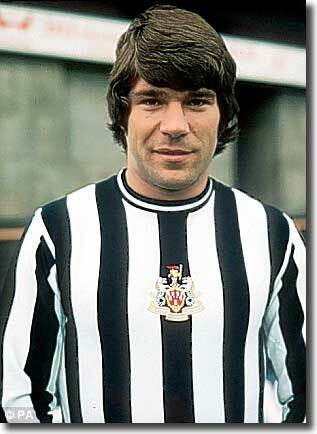 And he made Malcolm Macdonald the player he was at St James' Park. I reckon Hibby made 75% of Mac's goals." Macdonald himself described Hibbit as "One of the game's great passers. He made countless goals for me at Newcastle. He smoked like a chimney and enjoyed a few pints and a game of dominoes on a Thursday night, but come Saturday, he was up and down that line." Hibbitt was renowned for his rebellious streak, as recalled by Newcastle striker Paul Cannell in a story about Magpies manager Joe Harvey: "Joe was a gentleman. He could never be accused of being tactically astute, but his management skills were on a par with Sir Alex Ferguson. I remember one incident with much amusement. Smoking was a habit not recommended for pro athletes, but two of the Toon's greatest players, Supermac and Hibby, were twenty-a-day men. As soon as the half time whistle sounded they were the first down the tunnel into the dressing room sparking up! "Burky (coach Keith Burkinshaw) didn't approve, and after numerous requests for the two main perpetrators to quit smoking in the dressing room he convinced Joe Harvey to pass an edict. A notice was strategically placed above the dressing room door for all to see: No Smoking In The Dressing Room. Joe Harvey. Manager. "All hell broke loose, Mal and Terry refusing to obey and threatening to leave the club if they couldn't have a cigarette. In the midst of the mayhem, in sauntered Joe with a cup of tea in his hand, and in his typical laid back way enquired what the problem was as we were winning 2-0. Burky explained, quoting a lack of respect, disobedience and rebellion among a few more choice words. Mal and Terry just dug their heels in harder and threatened not to go out for the second half. "Joe put his cup down, disappeared into the adjoining treatment room, and returned with a felt tipped pen. He pulled up a chair under the offending sign, stood up and wrote an addition to the sign. It now read: No Smoking In The Dressing Room. Joe Harvey. Manager. Except Terry Hibbitt and Malcolm Macdonald." Tony Hill (OzWhite): "Terry liked to talk and was not afraid to offer his opinion even when it wasn't wanted and as a result he often got himself into trouble with the men in black resulting in many games missed through suspension. But he didn't just antagonise officialdom; he had many a set to with his own players who often took exception to his unrequested advice. "The most famous incident happened after United slumped to a single goal defeat at Molineux on New Year's Day 1972 when comments made by Hibbitt led to all hell breaking loose in the changing room. However he was not an unpopular player as there was no lasting antagonism. He candidly admitted to being the biggest moaner at the club but manager Harvey knew how to deal with him; a box of fags usually proving enough to calm him down." Andrew Mourant: "It says much for the wiles of Don Revie's management that he kept a man of Terry Hibbitt's ability content to be in the shadows at Elland Road for so long. For Hibbitt was another occasional player who, when he decided he was worth a regular first team place elsewhere, proved a fine footballer. He is not remembered solely at Elland Road for his skills: Hibbitt had the reputation of being the only Leeds player who dared cheek the godfatherly Revie. "Certainly such an elegant player - his performances were described by one critic as deliciously wispy - deserved more regular outings. Hibbitt could produce intelligent, sweeping passes with his left foot as sweet as those of Giles and Hunter. But in his Leeds days, he was considered unable to cope with the physical demand of the team's unrelenting seasons as they campaigned for honours on all fronts. "For several years, Hibbitt, who, amid all the intensity at Elland Road, showed a cheery approach to the game, was confined mostly to the reserves. He started fewer than 50 matches but when a £30,000 move took him to Newcastle in 1971 belatedly his talents were brought centre stage where he caught the eye as a fine supplier of ammunition for the marauding Malcolm Macdonald. It was no less than he deserved. "His misfortune was to be overshadowed by Eddie Gray. Hibbitt's carefree, irreverent disposition provided light relief at Elland Road and his sparkling skills illuminated some drab performances. He had a stronger sense of his own worth than did Mick Bates and, finding himself still in the shadows, moved to Newcastle United where his talents matured handsomely. Hibbitt's untimely death from cancer at the age of 46 was mourned by supporters of both clubs." Born on 1 December 1947 in Bradford, Terence Arthur Hibbitt joined Leeds United as an apprentice outside-left when he left school in April 1963. Among his peers in that apprentice pool were Jimmy Greenhoff, Mick Bates, Jimmy Lumsden and Eddie Gray. Hibbitt signed professional forms for United in late 1964. Gray: "By far the best bit of fortune I had was that Leeds took me off the ground staff after a year - much to the annoyance of Jimmy Lumsden and one of his other pals, Terry Hibbitt, who had to remain on it for the full two-year period. Whereas I could heave the ground after our morning training sessions, they had to stay behind and continue doing jobs such as helping to sweep the stadium terracing and stands, clean the toilets and weed the pitch. "Most of Terry's colleagues remember him fondly, not just because of his midfield passing skills, but also for the moaning. He never seemed to stop. However, I have to acknowledge that his complaints about the way I was being treated in comparison with Jimmy and himself were perfectly justified. The irony of the situation was that Terry and Jimmy, while finding those ground staff chores as irksome as everyone else, were probably the hardest workers among the whole group." Hibbitt's first senior opportunity came as substitute in the First Division game at Nottingham Forest on 19 February 1966, three months after his 18th birthday. Shortly after Peter Lorimer gave Leeds a 20th minute lead, Hibbitt was summoned from the bench to replace Paul Madeley, carried off after injuring his knee. Terry Lofthouse in the Yorkshire Evening Post: "Hibbitt quickly impressed as United kept on building up dangerous attacks. Twice the lad had dazzling runs up the left, and then he was just off target with a header as Bell centred. "It was no surprise when United scored again - twice within two minutes, and Bremner was responsible for them both, as he was with the first. He got Lorimer in the clear to round Grummitt and pass the ball into an empty net in the 25th minute and he gave Hibbitt his debut goal in the 27th. Hibbitt deserved all the back slapping he received, for he completely deceived Grummitt from 20 yards with a lob that went over the top of the keeper." The Yorkshire Post's Eric Stanger was even more impressed by Hibbitt, describing him as "A sprightly young man ... oozing self confidence in his first senior game, knowing when and where to run within the general team plan and scoring the third goal ... with an excellent shot which completely deceived Grummitt to dip under the bar. His general know how spoke much for his coaches." 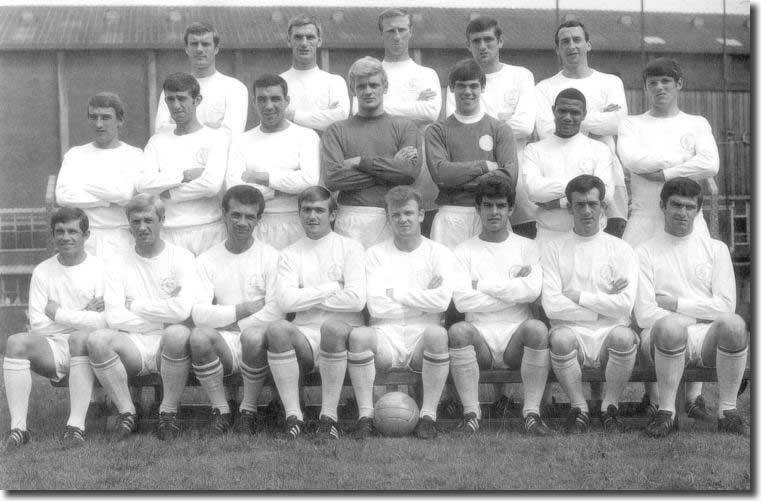 The performance was not enough to keep Hibbitt in the first team picture and his next opportunity came when Leeds travelled to meet Valencia in the Fairs Cup in February 1967. He was called into the side alongside Rod Belfitt and Eddie Gray, with Paul Reaney, Mike O'Grady, Jimmy Greenhoff, Albert Johanneson and Terry Cooper all injured. United pulled off an outstanding 2-0 victory with goals from Giles and Lorimer, and, as reported by Phil Brown in the Evening Post, "Hibbitt, with only half a League game behind him as experience, rose to the occasion at outside-left once he found his young feet". Eric Stanger claimed he "played as if a Fairs Cup occasion was no more awe inspiring than a Central League match". He had a shot stopped on the line by Paquito as Leeds played one of their greatest European games. Hibbitt was on the bench for the following League game, against Stoke City at Elland Road, with Johanneson returning to the starting eleven. He came on for the South African after 72 minutes and within a minute laid on the final goal for Belfitt in a 3-0 win, floating a deceptive centre into the goalmouth with virtually his first touch of the contest. A fortnight later, Hibbitt was given his first League start, at home to Aston Villa. He did some useful work, but suffered an ankle injury and was replaced by Greenhoff in the second half as Leeds lost 2-0. He enjoyed further games before the end of the season, against Manchester City and Sheffield Wednesday, when he scored the only goal of the game after eleven minutes, curling the ball over goalkeeper Springett from the edge of the area. Phil Brown commented, "Hibbitt's control, elusiveness and sharp eye for a colleague's chance with a pass were splendid." Hibbitt was given a decent run in the first team in the autumn of 1967. Opportunities were rarer after Christmas, but he scored the fourth goal in the 5-0 defeat of Southampton on 13 January with a beautiful cross drive from 20 yards and ended the campaign with 21 appearances to his credit, seeming to have made a permanent breakthrough. He had been in the party of 15 for the League Cup final in March but was omitted from the final 12. Hibbitt was also left on the sidelines when Leeds contested the first leg of the Fairs Cup final against Ferencvaros on 7 August 1968, but, with Johanneson and Giles suffering with injuries, he was a fixture on the left flank over the next few weeks. He came on as sub for Lorimer in the first League game at Southampton and scored the final goal in a 3-1 victory. Richard Dodd in the Yorkshire Post: "Hibbitt, spindly legged and more enthusiastic in his running than anyone on the field, appeared as substitute and helped to enliven an otherwise dull evening for 25,479 spectators... Hibbitt with a brilliantly executed shot with his left foot after 63 minutes made the ball dip under the bar for the third and final goal." He scored again after eight minutes with a well controlled header during the week in a 4-1 victory at QPR, when he was "the best winger on the field" according to Richard Ulyatt in the Yorkshire Post. After the following 2-0 victory against Stoke, Phil Brown wrote: "My doubts about whether United's forwards can carry them to the championship without marked improvement all round remain even with the arrival, as it were, certainly on his form so far, of Hibbitt in one of the problem spots of last season - left wing. His trickery, his mostly accurate and intelligent use of the ball and his dangerous shooting have been very useful indeed. This 21-year-old Bradford product of United's nursery is their most improved player this season." His goal 12 minutes from the end of the following game at Ipswich secured a 3-2 victory as a golden run continued. Andrew Mourant: "The emphasis was on results rather than entertainment; the absence of Giles through injury impoverished the team. Some of the brightest performances in an often arid winning sequence came from reserve left winger Terry Hibbitt." The game at Nottingham Forest on 24 August was abandoned, as Johnny Giles recalled: "One of the games I missed was the one against Notts Forest at the City Ground, which was abandoned at half time because of a fire in the main stand… An amusing incident to emerge from this unusual epi-sode concerns young reserve forward Terry Hibbitt, who went back into the dressing room when everyone had left to get the money out of his trouser pockets-and clean forgot to take his trousers as well! Terry was ribbed unmercifully about this for weeks afterwards." 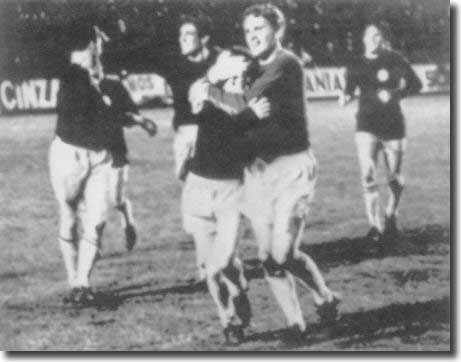 After missing out on the first leg of the Fairs Cup final, Hibbitt retained his place for the second leg in Ferencvaros' Nep Stadium on 11 September. He struggled to make a mark on a game remembered for a determined rearguard action by his colleagues and Hibbitt was replaced by Mick Bates after 58 minutes. As Geoffrey Green wrote in the Times, "That was a wise, tactical move since Hibbitt, as frail and talented as a Tommy Harmer of old, was scarcely the man for a struggle such as this, a struggle of strong shoulders and physique and stern limbs." Hibbitt lost his place after the 3-1 defeat at Manchester City on 28 September with the fit again Johnny Giles restored to action. Hibbitt made only two more League appearances that campaign as United strode to their first League title with the rejuvenated Giles in superb form. Hibbitt had another smattering of opportunities in the early months of 1969/70, including during the 6-0 defeat of Lyn Oslo in the European Cup. He made a telling contribution, laying on the opening goal after six minutes. Collecting the ball on the right wing,, he whipped it straight into the middle for Rod Belfitt, who took possession and coolly slotted home his shot. After 20 minutes, Hibbitt added the second, his first goal in European football, hammering home first time from a Lorimer cross. Early in the second half, Hibbitt notched his second to make it 4-0. Nevertheless, Hibbitt quickly fell out of favour with Giles and Eddie Gray monopolising the left side of midfield. With Paul Madeley also deployed in the middle of the park and Mick Bates being seen as the natural deputy to Giles, Hibbitt's appearances were restricted to cameos in inconsequential matches. Don Revie was notoriously intolerant of those who questioned his authority, even one with the swagger and undoubted talents of Terry Hibbitt. 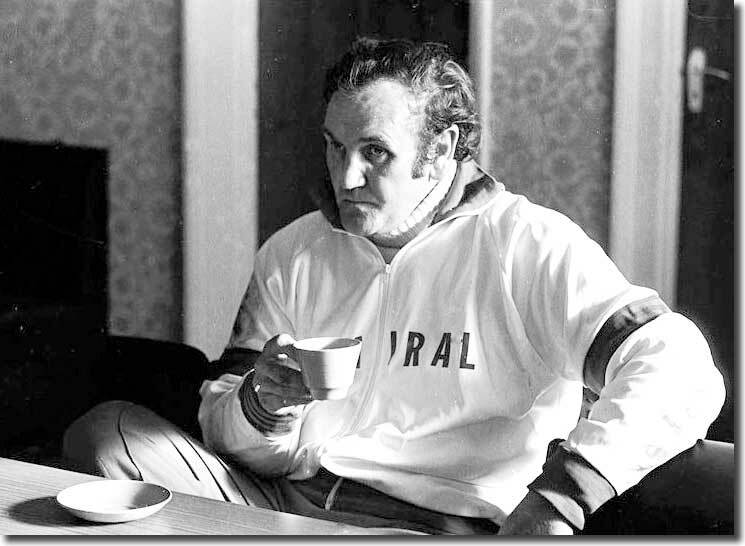 The impulsive midfielder could not hold his tongue and was one of the few Revie Boys to answer the Gaffer back. He was an expensive luxury to Revie's mind. In October 1970, the first hints surfaced that Hibbitt was not happy with life in the Elland Road stiffs. Barry Foster reported in the Yorkshire Post, "Mr Revie, who also has a considerable casualty list to add to his problems, may have yet another one soon for winger Hibbitt is unsettled and is to seek an interview about his future with the club. Hibbitt, 22, was in the 13-strong party at West Bromwich and named at inside-right on the programme but when the team was announced he was the one to stand down, the substitute's role going to defender Davey with Madeley taking over from the injured Gray on the left wing, Hibbitt's usual position." The unrest came to nothing at time, but after he made just three appearances in the 1970/71 season, the patience of Hibbitt was exhausted and he asked Revie for a transfer. An offer came in from Newcastle United at the beginning of August 1971 and after a few days thinking it over, Hibbitt moved to the North East in a £30,000 deal. "We were impressed. We knew what a good player Terry was. He couldn't get into the Leeds side on a regular basis because the great Johnny Giles played in his position, and Giles' recognised deputy was Mick Bates. But Terry had made frequent appearances as a substitute. The previous season, I'd seen him on Match of the Day coming on for Leeds just about every Saturday, and it was obvious he had a great left peg and a wonderful ability to ping the ball about. "Joe, having imparted his big news, turned on his heel and went to the door. But just as he opened it he halted, looked over his shoulder and said, 'Mind, he'd cause trouble in an empty house!' And, by heavens, he wasn't kidding. "Norman looked over his shoulder to make sure he couldn't be overheard, then said, 'Well, it was round about the end of last season. We'd done a training session, and at the end of it we were having a bit of a five-a-side, with the goalkeepers playing out. All five-a-sides here are pretty competitive, and Gary Sprake and Paul Reaney have tackled each other, neither liking the way the other has gone in. So they are on their feet now with fists clenched, squaring up to each other. "At that point, little Hibby's come running straight over to them and gone, "Yak, yak, yak, yak." So Paul's turned to him and said, "Terry, this hasn't got anything to do with you. Piss off!" The warning falls on deaf ears, because Hibby's gone "Yak, yak, yak" again and given Paul a mouthful. Then Gary has a go. "Terry," he says, "you've been told once. It's nothing to do with you. Keep your nose out of it!" And Terry's turned to Gary and said, "Talking of noses, what about your wife's!" As I said, he had to go.'" 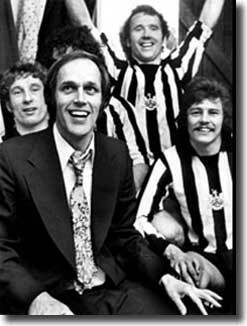 At the time, Newcastle manager Joe Harvey was rebuilding a team that had been on the wane since their own Fairs Cup triumph in 1969. He had sold Pop Robson to West Ham for £120,000, and strike partner Wyn Davies to Manchester City. Their replacements were Sheffield United's John Tudor and Luton Town striker Malcolm Macdonald, a club record £180,000 signing. Later in the season, Blackpool's Scottish international schemer Tony Green arrived at Newcastle in a £150,000 deal, while there were a clutch of exciting youngsters breaking into the first team, such as Irving Nattrass and Stewart Barrowclough. 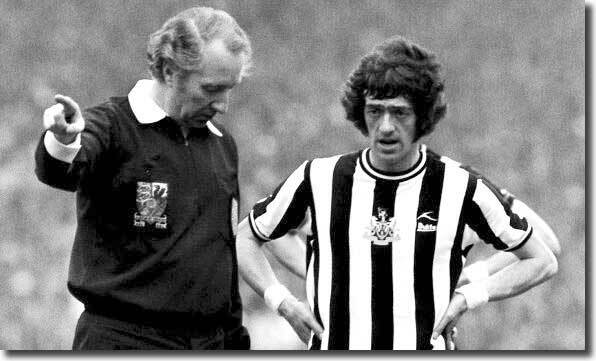 The switch to St James' Park was heaven-sent for Hibbitt, who rapidly established himself as the Geordies' midfield general, outshining Green, whose career was ended by injury in September 1972. 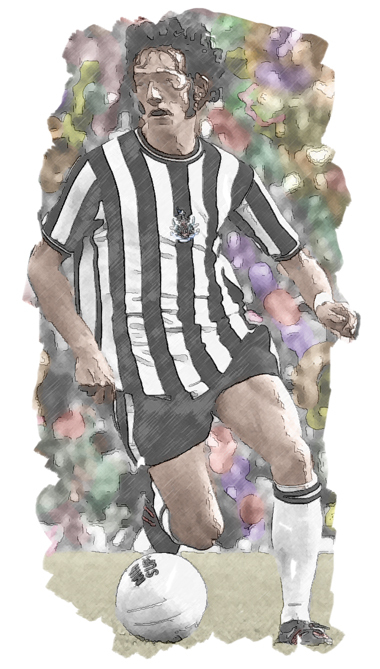 Hibbitt became a cult hero for the Toon Army, who lauded him with the chant of "Terry, Terry Hibbitt, Terry Hibbitt on the wing." Hibbitt and Macdonald made their Toon debuts in the opening day 2-0 defeat at Crystal Palace on 14 August. The pair hit it off immediately with Hibbitt's quick, accurate through passes providing the perfect ammunition for Supermac's all action front running. The Magpies got their first win of the season in a breathtaking 3-2 defeat of Liverpool a week later when Supermac bagged a memorable hat trick. It was a rare triumph that autumn as Newcastle struggled in the lower reaches of the table. Among their heaviest reversals was a 5-1 reverse against Hibbitt's former Leeds team mates on 1 September. His first goal for his new club helped them to a 2-0 win over Wolves a couple of weeks later. Hibbitt missed just seven games all season as he finally got the opportunity to confirm his potential, and Newcastle climbed to a secure mid table position by the end of the campaign. The mood was sombre, however, thanks to a humiliating FA Cup exit at the hands of non-League Hereford United. Undeterred by the initial disappointment, a new period of entertaining, but not always successful, football followed for the Toon Army. 1973/74 saw Harvey's exciting new combination vying seriously for honours. By November, Newcastle were in second place in the League, though they fell away to a 15th place finish. They also enjoyed a good FA Cup run, making it all the way through to the Wembley final, though they did require a replay to see off non-League Hendon United in the third round. It was the eight goals of Macdonald and the creativity of Hibbitt that drove them through successive stages, and the two men were outstanding in the semi final when Supermac got both goals in the 2-0 defeat of Burnley. Macdonald talked up United's chances of beating Liverpool in the Wembley showpiece, but it was one of the most one sided finals of modern times: Newcastle were battered 3-0. Malcolm Macdonald: "Unfortunately, we got things wrong from the start. Looking back now, it was a serious mistake to go down to the Selsdon Park Hotel in Surrey and spend a full week there preparing for the final. Like dogs, footballers love routine, and this arrangement took us out of our routine. It's all very well to go away, but do it when all the major work has been done. "Then, on the Thursday morning, another wrong decision was taken, in my opinion. Thursday was always our main tactical day in readiness for the Saturday, and John Tudor and I couldn't believe it when it became apparent that Stewart Barrowclough would not play in the final. All that season, and the season before, we had used a formation that was 4-4-2 when we were defending and 4-3-3 when we were attacking. Stewart was the midfielder who would join me and John up front as a right-winger when we went on the attack. He was super quick - almost as quick as me - and he would whip in his crosses like a shot, which was great for strikers like John and me. Anyway, at that Thursday morning training session, Keith Burkinshaw started rearranging the team to play four straight midfield players, Stewart not among them. Barra himself was gobsmacked, absolutely shocked, at being left out, and John and I were very dubious about it. We wondered at first whether it might just be something to try out in training in case somebody got injured, but we gradually realised that this was the team that was going to play in the final. "We questioned the strategy, pointing out to Burky that Liverpool had, in Alec Lindsay, one of the slowest left-backs in the First Division. Lindsay hated playing against Barra, whose pace frightened him to death, and Stewart frightening Lindsay could cause panic among the rest of the Liverpool side. But it made no difference. Stewart was out, and Tommy Cassidy, who had played in the semi final and the sixth round second replay, was in. On paper, a midfield of Terry McDermott, Cassidy, Terry Hibbitt and Jimmy Smith looked exceedingly good. The plan was for McDermott to get wide and go like Barra, but it just didn't happen. That's hardly surprising since we'd only had that one Thursday morning to readjust to the new system and get it right. John Tudor and I were also worried about the tactical frailty of it. If you want to play negatively against Liverpool, you fill your midfield; if you want to attack them, you play with width. So it seemed to us we were taking the negative option. But, as footballers you say, 'OK, perhaps they know best', and you go out with a will to try to make it work. "When he stood up, the waistband of his bottoms, which would have fitted Billy Bunter, was actually underneath his armpits. So the shout went out for safety pins so that we could look half decent when we went out. Later, we discovered how the tracksuits had come to be foisted on us. Stan Seymour Jr, one of the Newcastle directors, owned a sports shop, and it turned out that he'd got a whole load of outsize tracksuits he couldn't get rid of, so he did a deal with the club to sell them off as a job lot. All this, too, at a time when kit companies were falling over themselves to supply clubs with sportswear for the big occasions. But that farce over the FA Cup final tracksuits, I'm afraid, was typical of the board's thinking back then. Liverpool, in contrast, went out for the pre-match preliminaries wearing just tracksuit tops to go with their all-red strip. Psychologically, we were a goal down before the kick-off. "The game itself, when it started, seemed to fly by. It felt like just the blink of an eye before we were coming off at half-time with the score at 0-0, but not because the first half had been a thriller. I remember walking towards the tunnel and saying to Frank Clark, 'That's the worst we've ever played. There's no way we can play as badly as that in the second half. We've got a shout here, and we've been absolute rubbish.' Frank agreed that we'd been terrible. We couldn't string a pass together, we weren't getting forward and, incredibly, Liverpool were just as bad. "It all changed in the second half, though. The writing was on the wall for us when Alec Lindsay began to stride into the acre of space in front him that was going to become our downfall. Our four midfield players were tightly grouped in the middle of the park, and without Stewart Barrowclough there to put any pressure on him, Lindsay was just dribbling the ball forward and playing almost like an outside-left, not a left-back. Steve Heighway, in front of Lindsay, was making his runs from the left wing across the field in an effort to drag the right full-back across, but on one occasion he came forward into the safer space and smacked one from outside the box. It flew into the top corner, but the linesman on the far side stood there with his flag up. Offside! As I say, though, the writing was on the wall. We were all shouting and screaming that we had to fill that hole on our right, but it never happened. Liverpool just steamrollered forward as if we didn't exist and ran out 3-0 winners. It was all too easy." It is notable that the match remained goalless until just before the interval when Hibbitt's mobility was reduced drastically by a wrenched knee. Until then he had represented United's most likely hope of upsetting the rampant Merseysiders. Nevertheless, things seemed to be looking up for Newcastle and Terry Hibbitt at the time. After Don Revie's appointment as England manager in 1974, Hibbitt was one of 85 players called up for the first get together. Malcolm Macdonald: "My first contact with the former Leeds manager was at the massive gathering of potential England candidates he organised in Manchester as a first step towards putting a squad together. There must have been nearly a hundred of us from as many as twenty clubs, all staying at a city centre hotel. It was a new and interesting way of approaching the job, and we went along with open minds to see what happened. There were five of us from Newcastle - me, John Tudor, Terry Hibbitt, Terry McDermott and, I think, Irving Nattrass and my club colleagues found it inspirational because they had never been considered at international level before and were now getting some recognition. "We all arrived in Manchester on the Saturday after our games and were told there would be a meeting on the Sunday morning. Most of the players saw that as an excuse to enjoy their Saturday night in the usual way, but I played it very cagey. I decided to keep my head down… I thought to myself, 'Tread very carefully, don't give this feller an inch.' I did go out, but I made very sure I was back a good fifteen minutes before the midnight curfew. I also made sure that everybody in Revie's managerial party saw me in that hotel at a quarter to twelve. There were always a few who went well overboard, but I decided on this occasion to keep my nose clean and look after my own interests. John Tudor was with me, and we had a couple of beers in the hotel before going off to bed. "The two of us felt very virtuous the next morning, then, when we saw how many sore heads and bleary eyes there were at the meeting with Revie. We listened to him outline his thinking, had some lunch, then departed. We, the Newcastle contingent, had come from London, where we'd been playing Queens Park Rangers, to Manchester by train, but it was difficult in those days to get from Manchester to Newcastle by the same means, so we decided to hire a car. "John disagreed with me; he was an eager beaver who thought a new era was dawning. He also thought that, having been included in the call-up, he might have a chance of playing for England. "Terry Hibbitt saw it very differently, however. He had worked with Revie at Leeds and took a more pessimistic view. 'All he's doing,' said Hibby, 'is setting out the ground rules and warning you not to break them. The stick he will beat you with will follow.'" Hibbitt's cynicism was well founded; he never came near an England cap. 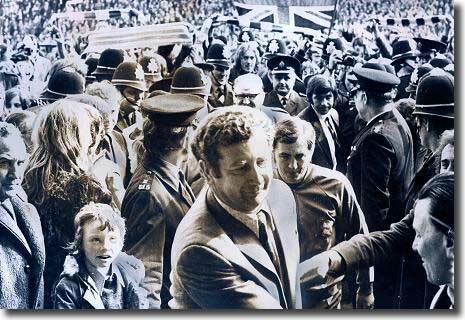 With Newcastle fans restless after another disappointing finish, manager Joe Harvey resigned on 1 June 1975, exactly 13 years after he took up the post. His replacement was the little known Blackburn manager Gordon Lee, notoriously apprehensive regarding big name players. He promised ominously, "There will be no stars on Tyneside" when he was appointed. "I couldn't believe it! I'd just rushed all the way back from Johannesburg only to be sat down in the manager's office and quizzed about Terry Hibbitt being a troublemaker! 'Let me tell you this,' I said, anger already rising in me, 'Hibby's a great player, and that's all you need to know. Beyond that, this conversation is terminated. I'm off. I'll see you next in training.' And away I went. "I knew things were afoot almost from the word go. As the season reached November, I had the distinct impression the new manager would prefer it if I wasn't at the club. At the beginning of the season he introduced his new signing, Alan Gowling, into the dressing room as the man who was going to finish the season as top goalscorer. "At this announcement I just looked at Gordon Lee and said 'Over my dead body'. At that moment Gordon actually bet me that Alan would finish the season with more goals than me. I said to Gordon: "I'll bet you a week's wages and I'm now giving you 2-1 because I know how much you earn'. "I was on twice the money he was. The problem was he started playing me in a withdrawn role, in deeper roles and wide roles and telling me to man mark right-backs and midfield players. It was an utter nonsense. It was not only me; he was doing stupid and silly things with Terry Hibbitt as well. "Gordon Lee also had a ruthless side to his nature, which showed itself after a midweek game at Derby. I think it was Micky Burns who got sent off after about only five minutes, but the point is we were down to ten men away from home against a good side. They went 1-0 up, we equalised, and then they went one up for a second time, only for us to fight our way back on to level terms again. It was 2-2 going into the last few minutes, then Derby nicked it at the death. Now, Terry Hibbitt was outstanding for us, a true hero on the night. He'd run himself into the ground and hardly had enough energy to walk off the pitch at the end. It had been a fantastic game that had called for superhuman efforts from all of us, but nobody had responded to that challenge better than Hibby. "Terry was so shocked by this that all he could say was 'What?' 'Freddie Goodwin, the manager of Birmingham, is outside in the corridor waiting to talk to you,' Lee added. 'I've agreed a deal with him, so go out and talk to him.' And with that, he turned round and marched out. "Never in my life had I witnessed anything so callous and cruel. Here was Terry, after one of his best ever games, just sitting there completely stunned by what his manager had just told him. I went over and sat down next to him, both of us still with towels round our waists, dripping wet and absolutely knackered after our efforts that night. "The driver, a lovely feller called Bob Green, was put in an awful position by all this. He just sat there knowing that the right thing was to wait for Terry Hibbitt, not to leave him stranded hundreds of miles from home at eleven o'clock at night, yet worried at the same time about what might happen to his job if he disobeyed the manager of Newcastle United. "But he refused absolutely to allow the bus to be turned round, so we left poor Hibby there standing in the middle of the road outside the Baseball Ground. All he could do was go back into the club and order a taxi to the railway station. There, he had to wait for a train from Derby to Chesterfield, and after another wait at Chesterfield he got a connection to York. He finished up catching the milk train to Newcastle at about six o'clock in the morning, and got home at about nine. "On the bus back, I sat there thinking, 'That is it. I've put up with playing for this plonker long enough. He can go whistle now. I'm not interested in him or the club.' And when we got back to Newcastle, I made sure the directors found out exactly what had gone on. They knew that if they tolerated a manager who behaved in such a shoddy, callous way, there would be an uprising from within the dressing room, because it wasn't just me who was unhappy about it. Even some of Gordon Lee's men in the dressing room, so to speak, were appalled by what he had done. I, for my part, resolved that I wouldn't play another season at Newcastle if Gordon Lee was staying. "As for Terry, he went home and talked to his family and, yes, he went and signed for Birmingham. And, yes, he could be a bit of a scallywag, and, yes, he could let his mouth run away with him - on one occasion he got my goat so much … that I picked him up by his shirt front and hung him on a peg in the dressing room - but, by heavens, there was no excuse for Gordon Lee treating another human being in that fashion." Hibbitt's departure did not go down well with the Geordie fans, for whom Hibbitt was an idol. It was a standing joke in the coming months that players should always pack a clean shirt for away matches just in case they were next. 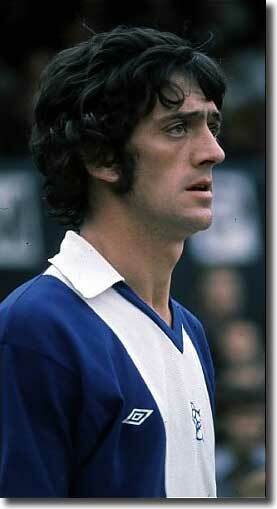 The Derby match was on 27 August 1975 and the next day Hibbitt signed for Birmingham City in a £100,000 deal. He had scored seven goals in 138 appearances for Newcastle. Hibbitt was made club captain at St Andrews, a decision which was a tactical masterstroke with the new responsibility obliging him to curb his notorious temper. The early weeks at the club were not promising, however, with Freddie Goodwin losing his job on 18 September after the Blues had collected only two points from seven matches. In November, unsettled by Goodwin's departure, Hibbitt made a written transfer request, but was warned he could face disciplinary measures by the club for revealing the news publicly. Goodwin's successor was his assistant, Hibbitt's former Leeds team mate Willie Bell, who said: "When the team were leaving for Manchester on Friday afternoon Hibbitt approached me and said a transfer request from him had been posted to the club and for the second time he said his wife was on the verge of a nervous breakdown because she had to move to the Midlands." Hibbitt's dissatisfaction eventually blew over, and he stayed on, as City battled to avoid relegation. He scored in a 3-0 defeat of Ipswich on 13 April that significantly eased their anxieties and when another goal from the midfielder earned a draw at Sheffield United on 4 May, coupled with Wolves' defeat at home to Molineux the same evening, it confirmed City's survival. Birmingham continued to lurch along in the lower reaches of the First Division and Bell was sacked at the start of the 1977/78 season after five straight defeats and just one goal. While the club searched for a permanent replacement, Sir Alf Ramsey agreed to step into the breach on an unpaid basis. The man who won the World Cup in 1966 soon worked his magic, as Birmingham won four of their next five games, their best run in the First Division for four and a half years. Skipper Hibbitt summed up the reason for his immediate success: "You can put it down to one word, respect. Sir Alf is the sort of person to whom you must respond." In an interview with the author Dave Bowler, Kevin Dillon, then a 17-year-old, spoke of Alf's immediate impact: "He had something about him, an aura. He got us all together and the first thing he said was, 'Don't call me gaffer or manager, just call me sir,' and that broke the ice, really. He was very quietly spoken, but when he said something, you listened." For all the promise of that initial burst, Ramsey gave way on 6 March 1978, two days after a 4-0 hammering at Coventry that left the club still deep in the mire. Jim Smith was appointed a week later and quickly inspired a revival. City finished the season in a comfortable mid-table position. Safety long since confirmed and after three years and 110 games at Birmingham, Hibbitt returned to St James' Park on 3 May 1978 in an exchange deal involving Stewart Barrowclough. Scottish winger John Connelly also moved to Newcastle as part of the package. The United manager by now was former Wolves boss Bill McGarry, who had taken over in November 1977 after a spell as coach of the Saudi Arabian national team. He could not rescue the Geordies from relegation. The club was at a low ebb following their demotion. Chris Waddle, fresh from the sausage factory, was one of the young players on whom the club's future depended. Hibbitt as elder statesman and club captain was a vital figure now for a club in transition. McGarry had a reputation as a harsh task master. 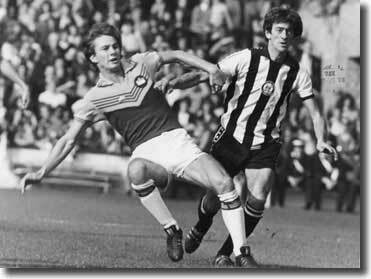 5ft 5in striker Alan Shoulder, plucked from obscurity with non-League Blyth Spartans in December 1978 for £20,000, was paired with future England striker Peter Withe in a Little and Large pairing up front to restore Newcastle's fortunes. They were Peter Withe and Peter Without - a man who over a long career was to win two First Division championships, a European Cup, and be capped 11 times by England, partnered with the pit lad who knew no fear. In his first full season at the shoulder of Withe, Shoulder scored 21 goals. Shoulder recalls that campaign thus: "Peter was great for me. He'd worked on the Liverpool docks and we basically had the same toughness about us. We instinctively knew what the other was going to do. I would be aware of whether he was going to hold up the ball or flick it on. If he did that I was away. He took the battering in the penalty box and I fed off the pieces. Terry Hibbitt used to aim for big Withey and I was loitering. People compared us to big John Toshack and Kevin Keegan at Liverpool." Shoulder recalls a New Year's Day derby at St James' Park against Sunderland. His goal helped get room mate David Barton off the hook, appropriate as it was Shoulder who had hung him there! "Bill McGarry took us to the Holiday Inn for the night to keep everyone off the booze," smiled Alan. "We all had to be in bed by nine o'clock watching television. Around midnight all I could hear were lasses running up and down the corridor shouting and yelling. I turned to Davey and said 'Tell them to go away. We're playing Sunderland tomorrow'. "Davey was up and out like a flash. Only trouble was he slept naked and there was a man 6ft 3in with not a stitch on yelling at the girls to keep quiet. 'We play for Newcastle United', he bellowed. I'd ventured to the door by now and he was five yards down the corridor. When he saw me he knew what was going to happen. 'Don't, Al', he pleaded, but of course I did. I slammed the door shut and left him outside as naked as the day he was born. "I could hear lasses giggling. I waited for a couple of minutes and then it all went quiet. I wondered what was up when there was a knock on the door. When I opened it there stood Bill McGarry with only a towel round his waist and his hair standing up on end like Bobby Charlton's on a windy day. What neither of us had realised was that his room was only a couple of doors down. "A fuming McGarry yelled at Barton 'If we get beaten tomorrow I'll sack you.' then turned to me and said 'I'll see you in the morning'. "Barty was paralysed. He kept saying 'We have to win, we have to win. The bloke's mental. He'll sack me all right. You have to get us a goal, Alan'. "After 12 minutes of the derby, Stan Cummins put Sunderland one up. Barty was distraught. However, midway through the first half, Peter Cartwright equalised and then Cass hit a beauty to put us 2-1 ahead. The game was still finely balanced, of course, but then Shaun Elliott handled the ball and it was a penalty. It was up to me. "The pitch was rock hard and we were playing in trainers. It was a bit of a lottery but I tucked the spot kick away and a relieved Barty carried me back to the halfway line." Bill McGarry, who snarled like James Cagney in a B movie, was the tough guy manager Newcastle had appointed to kill the dressing room revolt that had occurred under a rookie Richard Dinnis. "He was a tyrant," admitted Shoulder. "McGarry would verbally abuse players in an awful way in front of the rest of the lads. I always remember Bobby Shinton calling a players' meeting to discuss our expenses on a pre-season tour. "Shints was making out a great case why we should have more. McGarry just sat listening until he'd finished. Then he looked up and said: 'You'll take what you're given otherwise (waving a ticket in his hand) you can have this, Shinton, and find your own way home from the airport'. 'You wouldn't do that, boss', bleated Bobby. 'You've just signed me'. 'Aye', came the reply, 'and I wish I hadn't'." Shoulder recalls a Cup-tie against Newcastle that United lost on penalties. "The first three on both sides scored and then it came to Barty. He smashed the ball into the top corner - the best-taken penalty of the lot. It got to 5-5 then 7-7 and with Hibby and Boam opting out it was getting near the mark. Sunderland made it 8-7 before Jim Pearson stepped up and missed. Weren't the two sitting it out relieved! "My mate Maurice always used to nip into the players' lounge early doors to get a pint before it got really busy and he'd gone down before Alan Brown scored five minutes from the end of normal time. So he missed all the penalty drama and was bladdered by the time I got in there." 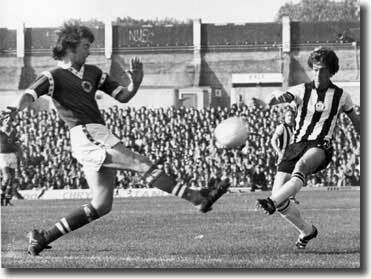 Newcastle finished the 1979/80 campaign in a disappointing ninth position, nine points below the promotion placings, one of which was taken by Birmingham City, relegated in the season following Hibbitt's departure from the Midlands. Bill McGarry was fired a few weeks into the 1980/81 campaign after elimination from the League Cup at the hands of Third Division Bury on 2 September. Newcastle were second bottom of the Second Division at the time with one win from four games. Arthur Cox took over as manager in September 1980. Hibbitt was restricted by an injury to his knee and started only 17 games, all before the end of November. He had begun well, scoring twice in his first five games, four of which ended in victories. Hibbitt's final appearance for the Newcastle first team came as a sub in a 2-0 defeat at home to Derby on 27 December. He was forced to retire from senior football at the end of the season, after 229 League games and 288 in total for a club for whose supporters Hibby had become almost a deity. 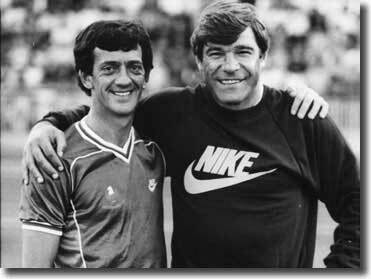 In 1984, he enjoyed a joint benefit game with former Newcastle colleague Malcolm Macdonald. He signed for non-League Gateshead that summer, going on to become the club's player coach in 1986. He was selected to play for England's non-League XI, his only representative honour and made 130 appearances in his time at Gateshead. Hibbitt later ran a pub in the North East as well as a paper shop. After contracting cancer, Hibbitt died in Newcastle on 5 August 1994, aged 46.